Today’s Supreme Court ruling has upheld the central piece of the Affordable Care Act, the individual mandate, but has deemed part of that act unconstitutional when it comes to another major piece, the Medicaid expansion. Under the Act, Medicaid will expand to cover all persons under 133% of the poverty line. Under the original Medicaid rules, only certain “covered groups” were eligible; namely the aged, blind, disabled, children, or parents with dependent children. No provision was made for poor childless adults. The Affordable Care Act sought to change that, and conditioned all future Medicaid funding on states’ compliance with the new coverage rules. Chief Justice John Roberts, in his majority opinion, deemed that the federal government forcing the states to comply with the expansion, lest they lose all Medicaid funding, was unconstitutional, stating, “In this case, the financial ‘inducement’ Congress has chosen is much more than ‘relatively mild encouragement’ — it is a gun to the head.” Therefore, the Medicaid expansion under health reform is now optional; states can choose to accept or refuse the conditions for the Medicaid expansion without fear of losing current Medicaid funding. The question now becomes whether states will participate in the expansion, especially given the fact that Medicaid spending is one of the largest expenses for states. Back in 2010, I released a publication for the Weldon Cooper Center that estimated that over 460,000 low-income Virginians would become eligible under the Medicaid expansion in 2014, with between 240,000 and 340,000 actually enrolling if Virginia chooses to participate. Demographically, these newly-eligible Virginians would be fairly young and most would live around the commonwealth’s major metropolitan centers and college towns. If Virginia chooses not to participate in the Medicaid expansion, many low-income adults would have to find alternative sources for health insurance because they would not be eligible under the original Medicaid rules. This may or may not be a significant problem. 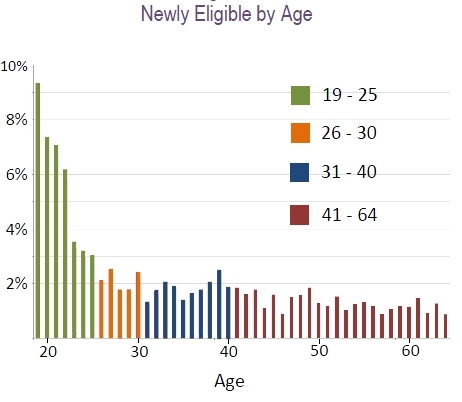 The newly eligible that are under age 26 (most of the newly eligible) may be able to stay on their parent’s insurance, if they have it. Also, because they are ineligible for Medicaid, these low-income adults might move to private health insurers using the federal subsidies under the Affordable Care Act. Meghan McCarthy at the National Journal writes that these subsidies could prove to be more expensive for the federal government than enrolling them into Medicaid. This would increase the cost projections for the health reform law and possibly add to the deficit. If, however, Virginia chooses to participate it would be responsible for some of the cost of the expansion, but not the majority of the costs. The federal government is expected to pay for almost all of the initial costs of the expansion, with slightly decreasing support over six years (reaching 90% federal coverage in 2020). Yet many governors have complained that, given current strains on state budgets, the Medicaid expansion would be too much of a financial burden, even if the states pay only a very small percentage of the costs. While some analysts have argued that Virginia will get a good deal and stand to gain from the Medicaid rules and other health insurance reforms, it will probably be a hotly contested debate on whether Virginia participates in the now optional Medicaid expansion.